Do you have a minute to spare to learn some English? 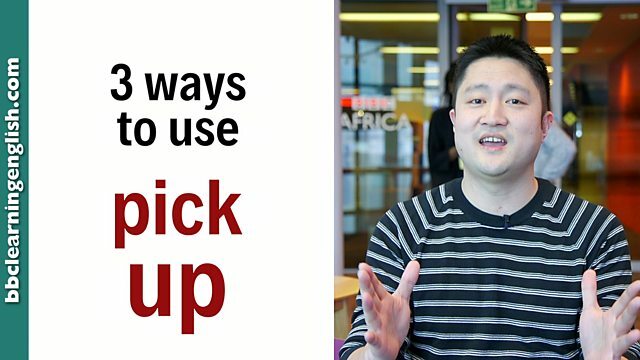 Kee is keen to tell you all about three ways to use 'pick up'! Give us 60 seconds and we'll give you the English! Hi, this is Kee from BBC Learning English. Today I'm going to tell you three different ways of using the phrasal verb pick up. First, we use pick up to describe learning something. So, for example, I can say: Children pick up languages very quickly. And so can you at BBC Learning English! Second, we use pick up informally to describe buying something. For example: I often pick up some milk on my way home. Third, we use pick up to describe getting an illness. I think I picked up a cold. So, we can pick up languages, pick up some milk and pick up a cold. 'Pick up' is a phrasal verb. This means it is a verb (pick) followed by a particle (up). Phrasal verbs are tricky because they can have many different meanings depending on the context. Children pick up languages very quickly. I picked up the guitar from spending time with musicians. We can use pick up informally to describe buying something. I often pick up some milk on my way home. She picks up lots of items in the Christmas sales. We can use pick up to describe getting an illness. I think I picked up a cold. He picked up the flu from his classmates. What kind of verb is 'pick up'? Which of these can we NOT use 'pick up' to describe? Use contextual clues to help you understand the meaning of 'pick up' in each sentence.